Supporting the Blancpain GT Series Endurance Cup opener at the Autodromo National di Monza at the weekend was the SRO sanctioned GT4 European Series and their first two - one hour races of the season. With no less than seven Aston Martin Racing V8 Vantage GT4's being entered into the sizeable thirty seven car grid, decent racing and incident was always going to be inevitable but to then add persistent rain over the time of one of those two hours of racing and multi class abilities simply added to the mix. 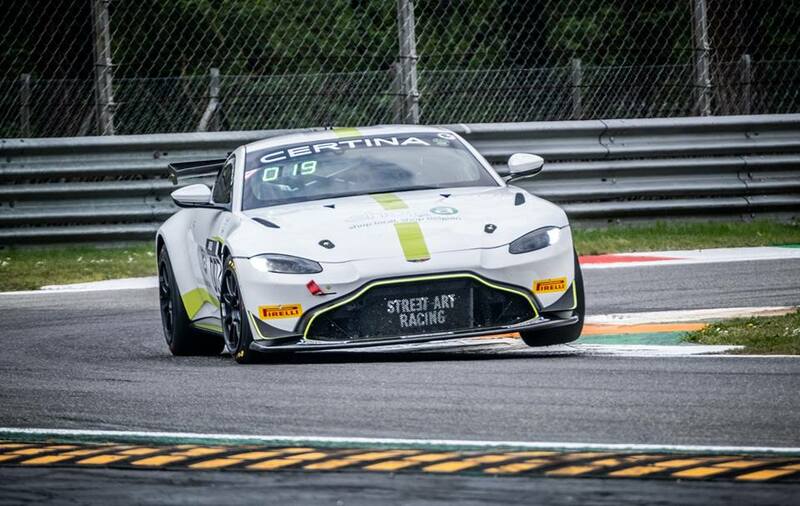 With the exception of the Generation AMR SuperRacing, Street Art Racing (Belgium), Academy Motorsports (UK) and PROpeak Performance (Germany) were all be competing for the first time with the new 2019 turbo charged AMR Vantage GT4. 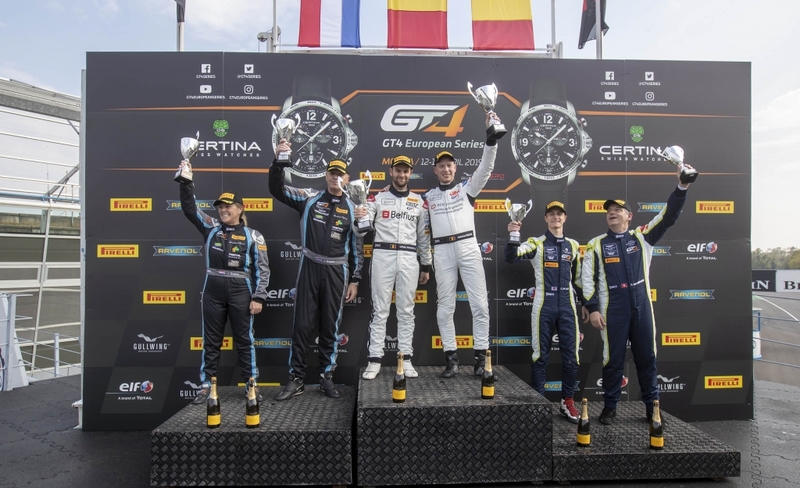 With the factory having burned the midnight oil in getting all of these new cars out all of these three teams, some had only received their second GT4 chassis about a week prior to the race meeting. 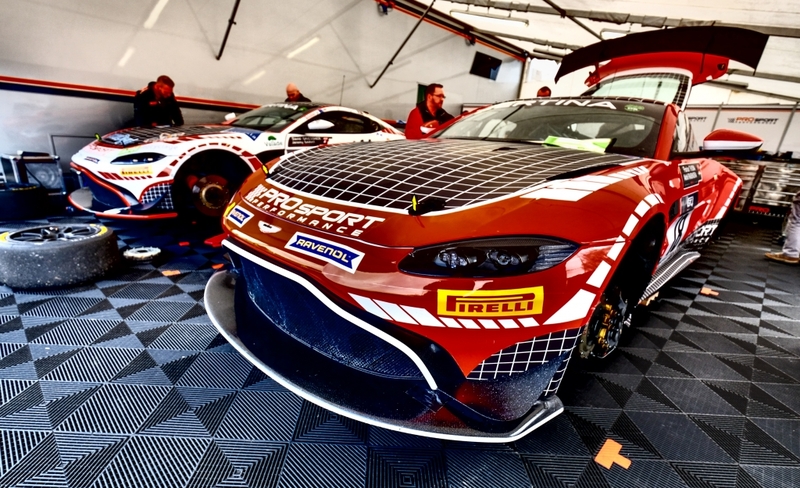 With limited track time leading into the event it was important for all drivers to get as much knowledge and understanding of both their new cars and indeed the race track with many drivers racing it for the first time and the constantly changing conditions certainly added to that learning curve. By the end of the meeting there would be some real 'winners and losers' even within the #TeamAMR field. Race 1 on Saturday was with the most favourable track conditions of the weekend with incident still never far away as the #19 Propeak Performance car of Jeremy Sarhy sustained sizeable front end damage to his car in the opening sequence of corners. 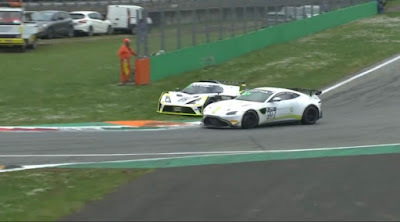 The young Frenchmans race would then go bad to worse with a drive through penalty for an incorrect starting procedure before ultimate retirement from the race! With two McLaren 570s's charging away at the front of the pack, individuals behind soon began making their own way up through the grid from the starting position with the likes of Matt George (in the older normally aspirated engined Vantage) and the two Academy Motorsport drivers of Tom Wood and Matt Cowley all improving their track position as they became more comfortable wit their surroundings. 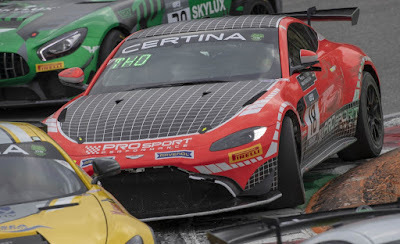 Just prior to the opening pit stop window, Wood was the highest placed AMR runner in the #62 Academy car having moved up from P17 at the start with the #18 Propeak Performance car of Florian Thoma not too far behind on track in P15. Sadly for the #7 Street Art Racing car of Jamie Vandenbalck, his first experiences of the opening round of the GT4 European Series didn't last too long as his car was 'taken out' by an uncontrolled a KTM X Bow going into the first chiccane at the end of the pit straight - both cars were out the race on the spot and another Safety car intervention was required. At the time of the chequered flag for race 1 all had changed within the timing board for the AMR runners. The biggest winner out of this was the #17 Street Art Racing car of Pascal Bachmann and a very race inexperienced Clement Seyler who between them secured a podium P3 finish in their AM class. 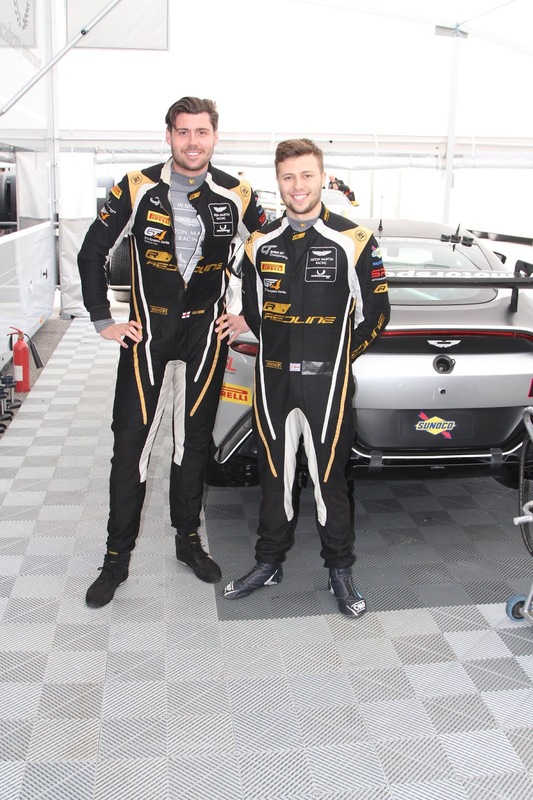 Ahead of them in the Silver Cup and Pro-Am classes respectively was the #19 Propeak Performance car of Akhil Rabindra and Florian Thoma who finished P13 and impressively the #61 Academy car of Will Moore and Matt Cowley to finish P15 overall - up from P28 on the grid. 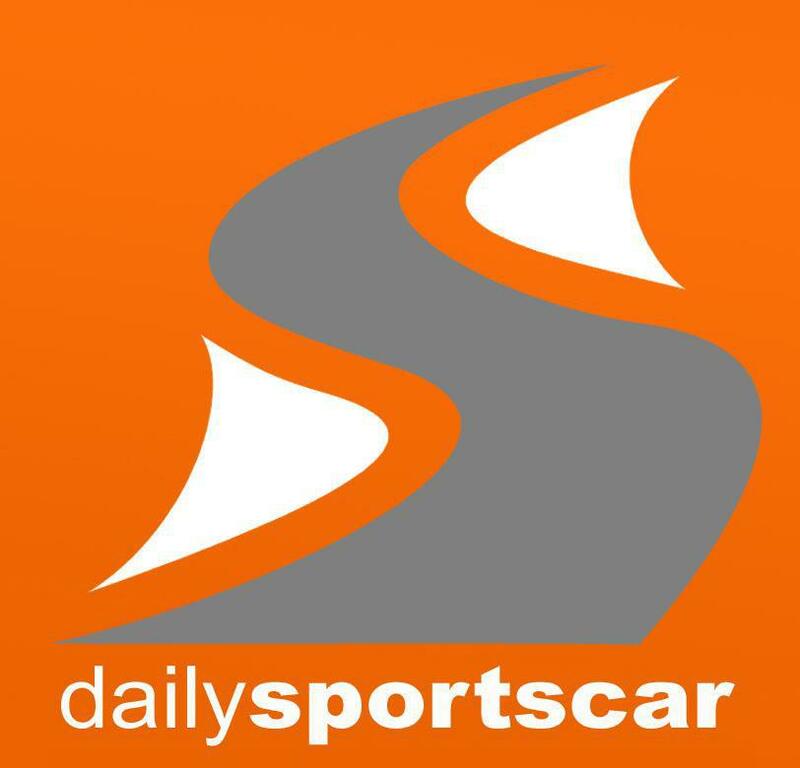 Race 2 on Sunday morning who however a wholly different matter as the rains had returned around the forested circuit necessitating a Safety Car start for the grid. Missing from the starting grid would however be the #44 Generation AMR SuperRacing car of Matt George and James Holder (a tactical decision by the team we understand to withdraw the car considering the track conditions and only car in the INV class) as well as the #7 Street Art Racing car of Julien Darras and Jamie Vandenbalck. 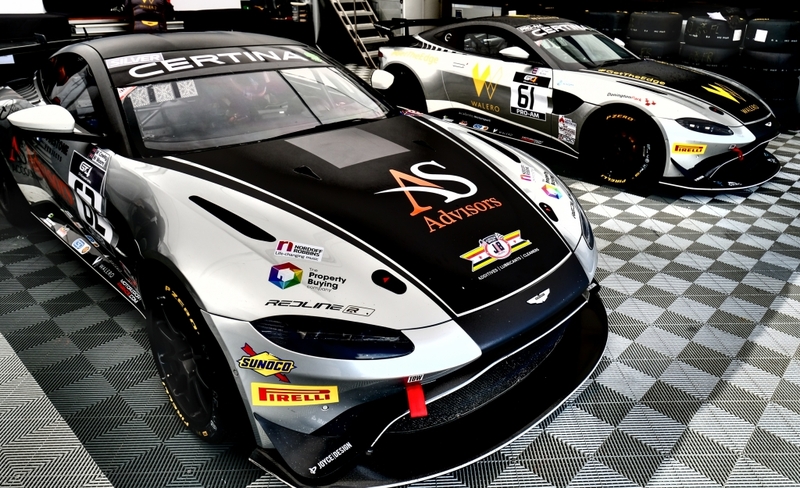 Front end damage sustained to their car in Race 1 was too severe for the team to undertake at the circuit and in fact will have to be returned to the AMR Prodrive factory for repairs hopefully in time for the next round at Brands Hatch in May. As a starting driver reversal of race 1 it would be both Propeak Performance cars that started highest of the now five remaining Astons with David Griessner highest in P6 in his repaired #19 car ahead of Akhil Rabindra in P13. Ten minutes of racing time was lost to the opening Safety Car sequence but with so much water upon the track and spray hanging in the air it was absolutely worth it as Griessner soon found out going into T1 and up the escape road and for team mate Rabindra, it looked like his preferred wet line was through the car in front with multiple contacts being made with the Mercedes ahead. Will Moore in the #61 Academy got himself a drive through penalty for straight lining a chiccane that would drop him down from his then P22 position just ahead of the opening of the pit stop window. 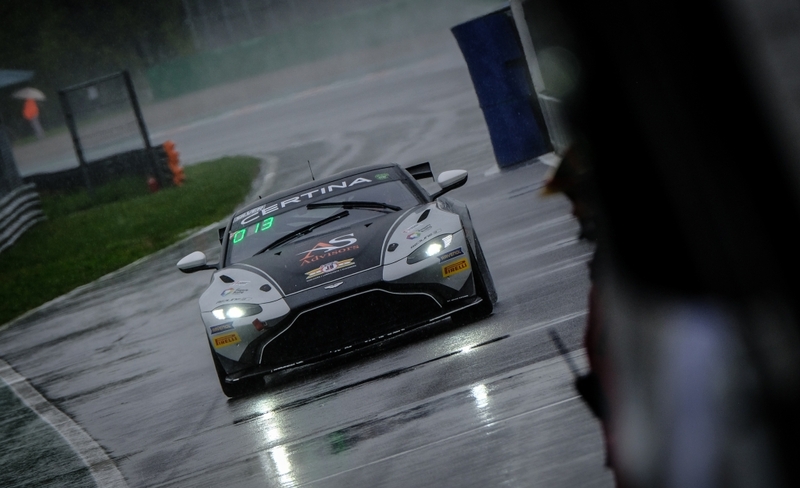 By the end of the pit stop window track conditions had not improved and indeed visibility was getting worse. Thoma was again the leading AMR runner in his #18 car in P10 with team mate Sarhy now down to P19 in his #19 Propeak car. Cowley, Seyler, Wood and Sarhy (in that order) were all having to try to recover their track positions after errors/slower lap times from their respective co-drivers in the atrocious conditions. 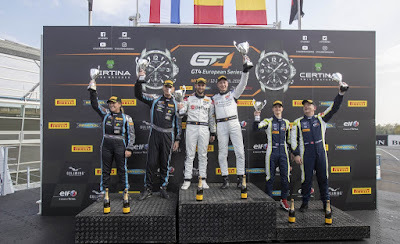 By the time the cars had almost 'swam' their way around the alotted hour and away from the viewpoint of the overall leading cars it was another class podium for the #17 Street Art Racing car of Bachmann and Seyler - this time at the next step up in P2 - great results for them. 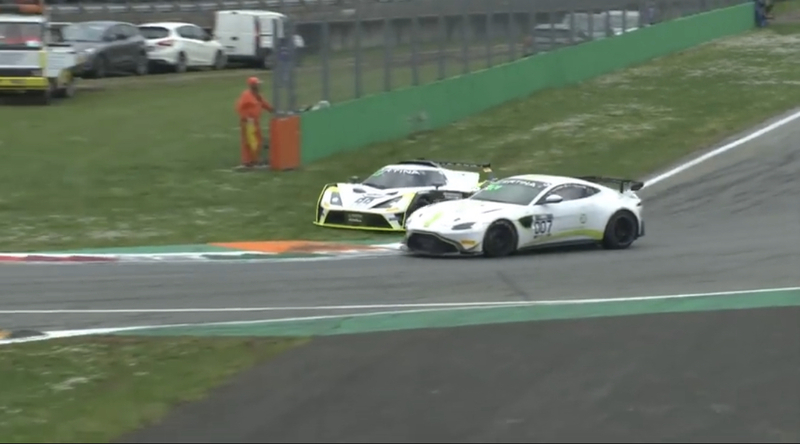 Thoma was again the lead AMR in P11 and a brilliant drive from Cowley had recovered their situation (following the drive through for Moore) with a P18 finish - how much higher would that have been without the penalty? Academy team mates Tom Wood and Fiona James finished in P21 which for James was a good result considering the conditions. 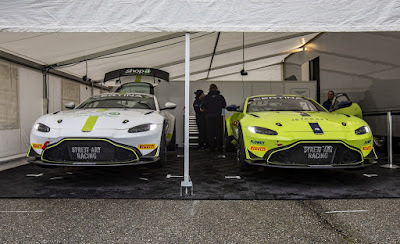 Whilst some still have some work to do upon their cars after this bruiser of an opening round, at least the three week gap to the next round at Brands Hatch will allow for some degree of calm contemplation to see just what needs addressing to move these new AMR charioted teams forward in the Series. The speed is there, the ability is there within the teams and the drivers - its just needs a little more direction forward!